that has ever earned a CT title. I had the pleasure to judged the Gateway VST test in Sullivan Missouri on Sunday with Carol Clark. 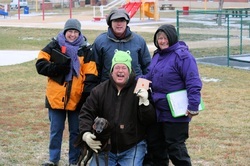 It was a clod, frigid day, but the predicted inch of snow didn't materialize and the test went off as planned. We had 2 passes. The fourth dog to run was Ule James and his Whippet Ziggy. Once he decided he could deal with the cold, he zipped thru the track to the fourth article and back to the warm car. 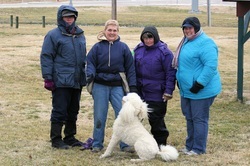 The fifth dog to run was the standard Poodle, Desi. He worried us a bit on the asphalt, but found his way thru it and onto the last article with ease. We had one other dog almost make it to the end, only to veer off before the last corner. It was a good day for the dogs - cold for the poeple. But the dogs are the ones who matter. Thank you Gateway for another well run, and entertaining test! This group has it together! but yesterday the stars and moon were lined up correctly. flying high on this one for a long time.